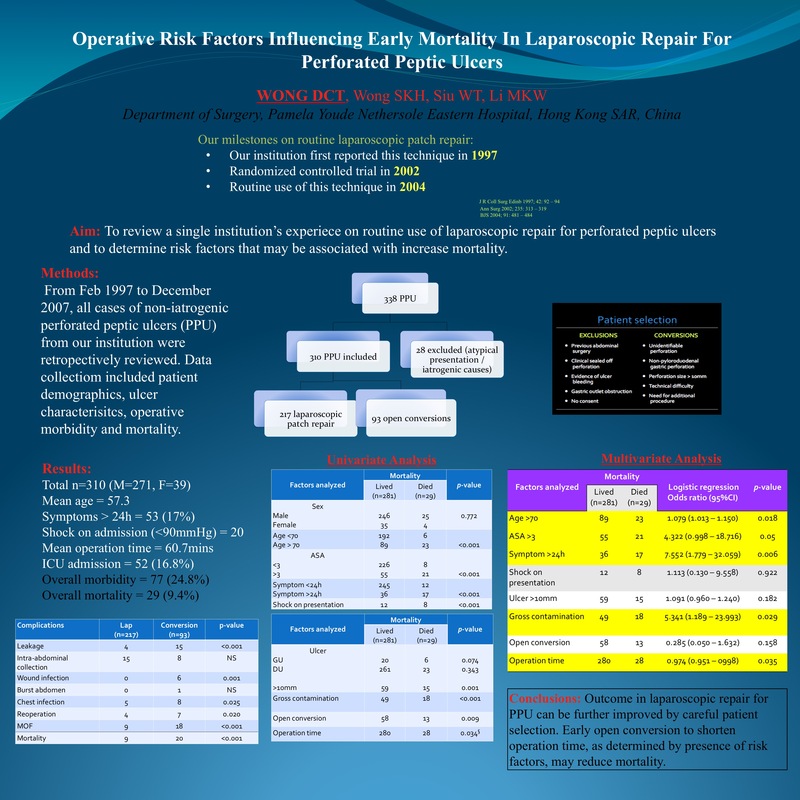 Aim: To review a single institution’s experience on routine use of laparoscopic repair for perforated peptic ulcers and to determine risk factors that may be associated with increase mortality. Methods: From February 1997 to December 2007, all cases of non-iatrogenic perforated peptic ulcers (PPU) from our institution were retrospectively reviewed. Data collection included patient demographics, ulcer characteristics, operative morbidity and mortality. Results: During the 10-year study period, there were a total of 338 cases of PPU. 28 cases were excluded due to atypical presentation or iatrogenic causes. Of the 310 cases included, 217 underwent laparoscopic patch repair. There were 93 cases of open conversion (30%) due to failure to identify perforation site, large ulcer, severe peritoneal contamination and/or additional procedure required. Overall morbidity rate was 24.8% that included leakage and collection requiring intervention, chest and wound infection, and reoperation. There were 29 cases of mortality (9.4%). Multivariate statistical analysis showed that preoperative risk factors (age > 70, ASA > 3, delayed presentation > 24h) and intraoperative risk factors (severe peritoneal contamination and operation time) were independently associated with increased mortality. Conclusions: Outcome in laparoscopic repair for PPU can be further improved by careful patient selection. Early open conversion to shorten operation time, as determined by the presence of risk factors, may reduce mortality.